The Fantasy Baseball Today Podcast talks the key news like Chris Sale's fail, James Paxton's triumph, a possible new ace emerging in Tampa and much more. We must start Wednesday's Fantasy Baseball Podcast with Chris Sale's latest disappointing start, magnified under the lights of Yankee Stadium. That was counterpointed by James Paxton's brilliant outing, his first as a Yankee against their Boston rivals. So there's joy in Pinstripe Nation in an otherwise rough April. Heath Cummings was decidedly unimpressed with Sale, whose stuff showed more life. Same goes for Chris Towers. "I won't buy him or sell him. I'm paralyzed with fear about Chris Sale," Towers said of the lefty's Fantasy value. Given all the ace angst surrounding Sale, it was a relief to have lots of good developments to discuss. Notably among those was another impressive outing for Tyler Glasnow of the surprising Rays. The 25-year-old righty is now 4-0 with an 0.875 WHIP in what looks like a breakout. 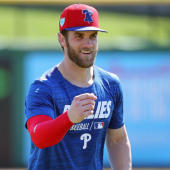 "He's part of that group of starting pitchers who I have moved right to the precipice of the ace tier," Cummings said. Responding to a sharp listener email (thanks, Joe), would Cummings trade Glasnow for one of the floundering aces? Or for Sale? It led to a fun exchange. "I think he could be this year's Blake Snell. I'm not ready to say he is this year's Blake Snell. I don't think his ceiling is quite as high ... but I'm pretty much all in. "At the same time, I would trade him for one of the struggling aces. " "You would trade him for Greinke?" Towers asked. "I would trade him for Greinke." "You would trade him for Sale?" "I don't want to do that," Cummings said. "Answer the question," Towers pressed. "If someone sent me Chris Sale for Tyler Glasnow, yes, I would accept it." Get those trade offers ready. We also cover: News and notes. Is Jose Quintana back? Drop Robbie Ray? Plus fill-in-the-blank, Mike Minor's great start and Yoan Moncada's homers.